High Cholesterol doesn't usually cause symptoms that you can feel or see. Symptoms related directly to high cholesterol levels are rare, yet serious health problems including coronary artery disease, stroke, and peripheral vascular disease are caused by high cholesterol. The most common symptom of coronary artery disease is angina, a symptom caused by inadequate blood flow to the heart due to blocked coronary arteries. Although the signs of angina vary from person to person, angina is usually characterized by some combination of: chest pain or pressure, pain radiating to the arms, shoulders, neck or jaw, shortness of breath, palpitations, weakness, nausea or sweating. Stroke may occur suddenly without warning symptoms prior to onset. Symptoms of stroke are weakness or numbness in the face, arm, or leg on one side of the body, confusion and slurred speech, vision problems, and dizziness or imbalance. Symptoms of peripheral vascular disease or blocked peripheral arteries are numbness, pain, tingling, coldness, or delayed wound healing in the legs or feet. 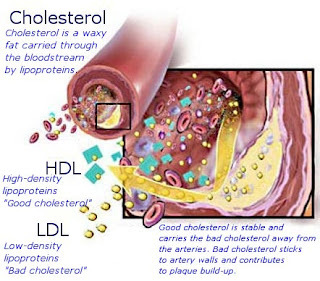 Cholesterol is a lipid, a type of fat found in the body. Only about 20% of cholesterol comes from the foods you eat. The other 80% is made by your body. Things such as family health history affect how much cholesterol your body makes. Additionally, cholesterol levels tend to rise as you get older. Cholesterol is composed of many components including high-density lipoprotein (HDL), low-density lipoprotein (LDL), and triglycerides. HDL is considered "GOOD CHOLESTEROL" because it takes cholesterol out of the arteries ansd sends it back to the liver, where it can be broken down and removed from the body. LDL is considered "BAD CHOLESTEROL" because if you have too much in your bloodstream, it can deposit plaque in and along artery walls and cause blockages to blood flow. Having high cholesterol means you have too much LDL in your blood. TRIGLYCERIDES are the most common type of fat in the body. High levels in the blood can increase your chances of developing symptoms of heart disease or having a stroke. Upon diagnosis of high cholesterol, cholesterol monitoring by blood test should be conducted more frequently than once a year, especially if cholesterol levels require treatment with cholesterol medication or if diabetes or weight gain are additional risk factors. "How can we play a role in preventing heart disease?" Seeking more knowledge about the symptoms of high cholesterol is a continuing process. In my opinion, the best way to treat a problem is to PREVENT a problem. Total cholesterol level, HDL cholesterol level, LDL cholesterol level, and TRIGLYCERIDES are measured by a routine blood test also referred to as a lipid panel or lipid profile. These tests can also help your doctor predict what your risk for heart disease may be. Nutriton is a key to preventing heart disease. Symptoms of heart disease will get worse with poor diets that lack the micronutrients necessary to maintain healthy cell membranes, like antioxidants and anti-inflammatory agents. Antioxidants found in PROGRADE NUTRITION can help fight free radicals in the body, helping to protect cell membranes, prevent the oxidation of LDL Cholesterol (bad Cholesterol), and prevent plaque formation within arterial walls. We can't control the genetic factors that we have been given. We can control our choices of lifestyle. The best way to treat a problem is to PREVENT a problem. Nutrient-packed PROGRADE NUTRITION offers much to those who are willing to optimize their health, boost their energy levels and do their best in preventing symptoms of high cholesterol. With these positive steps, you can stay healthier longer and prevent symptoms of high cholesterol.